Is your gate bigger than the regular-sized gates, but also not too big that it can be considered as a commercial-sized gate? If you are looking for a gate opener that suits its size, then read this ALEKO AS1200 review. This review is a compilation of the features, pros, and cons, as well as online customer reviews of the ALEKO swing gate opener. Here you’ll see what is the good side and bad side of this gate opener. The ALEKO company, which produces this dual-swing automatic gate opener kit as well as other types of gate openers, is a fairly new in the business, founded in 2005. Being a young business, they are building a reputation for their brand by providing many quality choices when it comes to their products as well as providing warranties for their products. The ALEKO AS1200 dual swing gate opener is an affordable option for those who have larger than usual residential gates measuring up to 10’ long and up to 660 lbs. per leaf. According to most reviews, it is easy to install and it also operates quietly. Its great as long as it is working but when it’s not, it is very difficult to connect to their customer service; when you get connected, some of their people don’t really know much about their products. Who is the ALEKO AS1200 for? One of the best features of The ALEKOAS200 residential gate opener is the capacity of up to 10’ long and 600 lbs. per leaf. This makes it big enough to handle residential gates that are quite bigger than the usual but not so big that commercial gate openers are needed. To operate this gate opener, you can plug it in or make use of a battery. The battery can also be powered by a solar panel, but these are not included in the purchase of the gate opener. There are other accessories that can be purchased and connected to this gate opening system. Among them are the push button, wireless keypad, metal keypad cover, additional remote controls, electric lock, and others. This gate opener is currently available on Amazon but the warranty isn’t specified, which is why you need to contact the seller to clarify the warranty they offer. It is available for domestic shipping only and is packed in an 18” x 7” x 35” box that weighs 28 lbs. 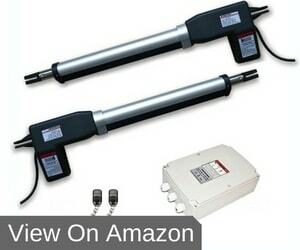 According to most ALEKO swing gate opener reviews, they received this product in a timely manner. There are mixed opinions in the online ALEKO AS1200 reviews, but we still think that it is a pretty good product that we can recommend. It is very affordable and it can be easily installed, so you won’t have to hire a professional. It works well when you get it to work, however, we still advise those who buy this product to be prepared with lots of patience in case there are problems with the gate opener. Their customer service hotline is known for not immediately answering, and for not being helpful at all.